It’s been over eight week’s since the attempt on the Human Alliance Security Chief, Bowen’s life, when he took a bullet and fell into the waters of Venice. Waking from a coma, he discovers he’s been in the care of the BlackSea physicians who are using him as an experiment to see if they can eliminate the degradation of the Psy blocker in his (and other’s) head. Agreeing to the high probability of experiment failure so he (and other humans) can live on his own terms, Bowen finds himself falling for the talent BlackSea chef, even though she brings him news of traitors within the Human Alliance. Kaia has lived her adult life deep in the blackest parts of the ocean, happiest when she’s cooking for her pack mates. Suffering from the loss of her best friend, Kaia is on guard against the Human Alliance security chief, who may be behind the kidnapping of her kind. However, her instincts tell her Bo is trustworthy, and she is torn between walking away or loving him only to lose him. Kaia and Bo are mates, each recognizing it from the first time they speak to one another, though neither is willing nor able to accept or acknowledge it. Their immediate attraction, coupled with the fact he may only live a few more weeks, gives each the push needed to just live life and enjoy each other. The opt for open communication and sharing quiet moments rather than allow the evidence the Alliance may be behind the brutal taking of the BlackSea members. It’s not smooth sailing, and the both make mistakes, but they don’t fall apart at the first sign of problems. I love that Ocean Light focuses on the relationship between Bo and Kaia. While there is the seriousness of his procedure and the mystery of the Alliance betrayal, the story spends the bulk of its efforts sharing the tender moments, fun times, and all the instances in between for Bo and Kaia. The romance is always front and center, yet never overwhelming. The romance is woven around each aspect of the story, creating cohesiveness and even warm-fuzzies when the more serious moments shift to center stage. In addition the wonderful romance between Kaia and Bowen, Ocean Light shares more fragments regarding the mysterious Consortium and the shifting balance in power since the fall of Silence. Furthermore, we finally see the inner workings of the BlackSea clan, something that has been illusive for far too long. There is still much to be unravelled and uncovered, but the author is developing strong ties and alliances that will be needed down the road if our heroes was to stop the Consortium. 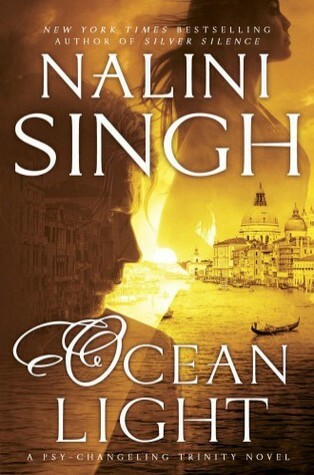 In the end, I really enjoyed Ocean Light for its romance, action, and intrigue. As Ms. Singh’s Psy-Changeling world continues to grow, it only gets better and better.